There’s not much intrigue but a surprising amount of suspense to keep word-lovers interested in Wordplay, director Patrick Creadon’s documentary about New York Times Crossword Puzzle Editor and National Public Radio Puzzle Master Will Shortz. Alongside are a constellation of puzzle enthusiasts including former U.S. President Bill Clinton, Senator Bob Dole, and Emily Saliers and Amy Ray of the folk-rock group The Indigo Girls, who feature in the film not only as puzzlers but also as puzzle solutions. In college at Indiana University, Will Shortz decided to create his own major, Enigmatology, which eventually led him to his current post as puzzle editor of the New York Times, which has been publishing daily crossword puzzles since 1950 and is widely regarded as the gold standard of puzzles. Jon Stewart, host of Comedy Central’s The Daily Show, is among the many puzzle addicts interviewed who enjoy matching wits with the puzzle “constructors” featured in the film. “I will solve the USA Today puzzle, but I don’t feel good about myself,” says Stewart. 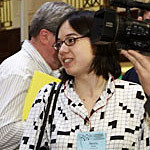 After he became puzzle editor, Shortz was responsible for bringing the puzzle up to date by including current events and pop-culture references yet upholding the standards for propriety set by its original editor, Margaret Farrar Petheridge in the 1940s. (In tackling a Sunday New York Times puzzle after I saw the film, it was helpful to know that solutions contain no references to bodily functions or indecent body parts.) Now, hundreds of thousands of people are addicted to the challenges of the daily and Sunday puzzles (the easiest puzzles are published on Monday and work up to most difficult by Sunday). Filmmaker Ken Burns, for example, will start his day without coffee but not without doing the puzzle. In 1978, Shortz also created the Annual Crossword Puzzler Tournament. Wordplay focuses on Shortz’s role at the New York Times and on the personalities of the eclectic puzzle solvers it unites each spring in Stamford, Connecticut. The film gives a fun glimpse into a cultural corner that we would not otherwise be likely to know much about. The segments featuring puzzle “constructor” Merl Reagle are especially enjoyable: he creates a puzzle using “word play” as a solution that illustrates the kind of knowledge and creativity required to make puzzles of varying levels of difficulty, often with dazzlingly clever themes. The documentary tracks several of the competitors in the 2004 tournament, including one Colorado man, Al Sanders, who returns to see if he can finish in anything but third place. (I won’t spoil it for you here.) The tensions run high as the competition progresses and it’s fascinating to see how people respond to the pressure, even when the stakes aren’t as high as they are for the kids and their families in the thrilling 2002 documentary Spellbound. Sometimes the tournament scenes come across as mundane and irritating, with poor hand-held-camera sound and picture quality — the kind of shots only the participants or their families could love. Between the bookish participants and the bland hotel meeting-room setting of the tournament, there’s not a lot of visual appeal in Wordplay. A bit of creative animation work helps illustrate Reagle’s puzzle construction technique. Yet there is something charmingly retro about all of this, in a time when most people sharing some arcane interest are congregating online on internet message boards. Many of these people talk about the satisfaction of doing the newspaper crossword in pen (some even admit to using a pencil). And it would be hard to find someone on a message board singing harmony with another fellow playing “If You Don’t Come Across, I’m Gonna Be Down,” a kind of folk anthem for the tournament’s puzzle fanatics. So if despite the lack of glamour and polish you can imagine laughing out loud, as I did, when someone says, “I’ve always been fascinated by the letter Q,” or when a contestant shrieks “Oh, my god!” as he solves one of the crossword clues with the word “Zolaesque,” you’ll definitely enjoy Wordplay.